خیری, زهرا, حیدرزاده, آبتین, پورعباسی, عطاءاله, گیوریان, حسن. (1397). ارائه الگوی همکاری بین بخشی برای اجرای مصوبه سیاست ها و ضوابط اجرایی آمایش آموزش عالی سلامت در جمهوری اسلامی ایران؛ چارچوب مطالعه. طب و تزکیه, 27(2), 83-90. زهرا خیری; آبتین حیدرزاده; عطاءاله پورعباسی; حسن گیوریان. "ارائه الگوی همکاری بین بخشی برای اجرای مصوبه سیاست ها و ضوابط اجرایی آمایش آموزش عالی سلامت در جمهوری اسلامی ایران؛ چارچوب مطالعه". طب و تزکیه, 27, 2, 1397, 83-90. خیری, زهرا, حیدرزاده, آبتین, پورعباسی, عطاءاله, گیوریان, حسن. (1397). 'ارائه الگوی همکاری بین بخشی برای اجرای مصوبه سیاست ها و ضوابط اجرایی آمایش آموزش عالی سلامت در جمهوری اسلامی ایران؛ چارچوب مطالعه', طب و تزکیه, 27(2), pp. 83-90. خیری, زهرا, حیدرزاده, آبتین, پورعباسی, عطاءاله, گیوریان, حسن. ارائه الگوی همکاری بین بخشی برای اجرای مصوبه سیاست ها و ضوابط اجرایی آمایش آموزش عالی سلامت در جمهوری اسلامی ایران؛ چارچوب مطالعه. طب و تزکیه, 1397; 27(2): 83-90. معرفی: موضوع آمایش سرزمینی از سال ها در ایران مطرح شده و در سال 1394 سند آمایش سرزمینی در آموزش عالی سلامت به عنوان اولین سند آمایش در کشور مصوب شد. یکی از ابعادی که در اجرای این مصوبه باید مورد توجه قرار گیرد موضوع همکاری بین بخشی است. به همین منظور مطالعه ای جهت طراحی الگوی همکاری بین بخشی برای اجرای مصوبه سیاست ها و ضوابط اجرایی آمایش آموزش عالی سلامت در جمهوری اسلامی ایران طراحی شده است. نوشته حاضر به بررسی چارچوب این مطالعه می پردازد. روش انجام کار: این پژوهش به روش ترکیبی و با استراتژی کیفی نظریه پردازی داده بنیاد انجام خواهد شد. جامعه آماری این مطالعه مدیران ارشد حوزه آموزش وزارت بهداشت و دانشگاههای علوم پزشکی کشور می باشند و نمونه گیری تا حد اشباع اطلاعات انجام خواهد شد. داده های مطالعه با استفاده از مطالعه کتابخانه ای، بررسی اسناد، مصاحبه، مشاهده و پرسشنامه گردآوری و پس از تحلیل داده ها نتایج آن در نشریات معتبر داخلی و بین المللی منتشر خواهد شد. بحث و نتیجه گیری: با استفاده از داده های حاصل از مطالعات گذشته 11 مولفه مرتبط با همکاری بین بخشی استخراج شده که در 3 گروه مولفه های ورودی، عملیاتی و خروجی مورد بررسی قرار میگیرد. این پژوهش به منظور تبیین الگویی بهینه برای همکاری بین بخشی در اجرای مصوبه آمایش سرزمینی به سوالاتی نظیر نهادهای مرتبط در اجرای مصوبه، ارتباط این نهادها، نقاط قوت و چالش های ارتباطی و راه حل های بهبود این ارتباط خواهد پرداخت. 1PhD Candidate, Faculty of Management, Central Tehran Branch, Islamic Azad University, Tehran, Iran. Introduction: The concept of spatial planning has been raised in Iran for many years. The Spatial Planning directive of Medical Higher Education was approved as the first in Iran in 2015. Intersectoral collaboration is one of the important dimensions for implementation of this policy. So, we are trying to design an intersectoral collaboration model for implementing Spatial Planning policy of Medical Higher Education in Iran. Methods: This study will be carried out by use of synthetic method and grounded theory as qualitative strategy. The target population of this study is managers of Iran Ministry of Health and managers of medical universities. Sampling will be stopped whenever information is saturated. Data will be gathered by Library study, literature review, interview and questionnaire and analyzed using proper software. The result will be published in relevant journals. Conclusion: Eleven relative components have been extracted by literature reviews which are investigated in 3 groups of inputs, operations and outputs. This study will try to answer to the questions about some issues such as Strengths and Challenges in the collaboration of involved organizations and improving these intersectoral collaborations for better implementation of spatial planning policy in Iran. 1. Glawson J. The Basics of Regional Planning: The Concept of Regional Planning (First Section). Art and architecture: Housing and rural environment. 1997;71, 72. 2. UNFPA. Iran at a Glance 2009 [Available from: http://iran.unfpa.org/country%20profile-fa.asp. 3. Mahmoodi SM. Trend Analysis of the Change in France Spatial Planning in 50 Years ago and propose for Spatial Planning in Iran Geography: Spatial Planning 2009;1. 4. Haj Yousefi A. Regional Management and Planning: Regional Planning in Iran from the Beginning to the 1970s. Urban Management. 2011;6. 5. Turani S, Haghdoost A-A, Maleki M-R, Ravaghi H, Tijang RD, Hekmat SN. The Backgrounds, consequences, and future of the integration of Medical Education and Health Service Delivery System. HealthMED. 2011;5(6):1847-56. 6. Shirzad G. Comparison of Regional Planning Patterns in France and Iran to Identify Optimal Strategies for Improving Regional Planning in Iran Islamic Azad University, Central Tehran Branch; 2013. 7. Larijani Baea. Medical Education in the Path of Reform and Innovation, Action Report (2013 – 2017). 1 ed: Tehran University of Medical sciences 2017. 8. Hanf K, O''TOOLE LJ. Revisiting old friends: networks, implementation structures and the management of inter‐organizational relations. European journal of political research. 1992;21(1‐2):163-80. 9. Mohammadpour A. Qualitative Research methods(Anti-way): Jameshenasan; 2013. 10. Khaki G. Grounded Theory Method in Management: Interview with dr. Seyed Mehdi Alvani: Fojhan 2013. 11. Danaei Fard H, Emami SM. Qualitative Research Strategy: Introduction to Grounded Theory Method. Strategic Management Thinking 2008;2. 12. Zarei B, Zarei A. Theoretical paradigms for explaining the formation of inter-organizational communication. Management Sciences 2007;78. 13. Ghadimi A, Zngene Nejad N, Amirkabiri A. Resource Dependency Theories: Concepts, frameworks and functions. National Conference of Management Ocean Iran: CIVILICA; 2015. 14. 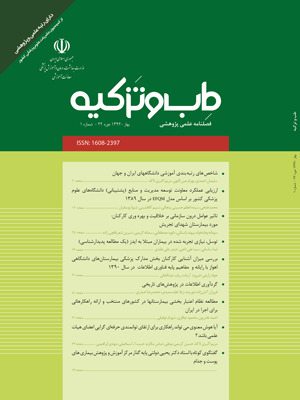 Ranaei H, Mortazavi M. Network Aprroach in Public Admivistration 1, editor: Research Center of Iran Parliament; 2012. 15. Rahman Seresht H, Ghayoor SM, Kalanipoor T. The dialectical evolution of stakeholder theory and corporate governance; from Hume''s utilitarianism to Aristotle''s virtue ethics. 9th International Conference of Management Iran 2011. 16. Moran M, Rein M. the Oxford Handbook of PUBLIC POLICY: Oxford University Press 2006. 17. O''Toole Jr LJ, Montjoy RS. Interorganizational policy implementation: A theoretical perspective. Public Administration Review. 1984:491-503. 18. Sharifzadeh F, Salehi Sadaghiani J, Kameli MJ. A Model for Network PolicyMaking in Naja (Iranian Police). Law Enforcement Sciences 2008;40, 41. 19. Pellegrino ED. The regionalization of academic medicine: the metamorphosis of a concept. Academic Medicine. 1973;48(2):119-33.